Residential Water Conservation Design Green New World’s water conservation system provides a way to reduce residential water consumption by up to 75%. Low flow high efficiency aerator faucets (1 GPM or 3.8 LPM) and high efficiency shower heads (1.25 GPM or 4.75LPM) combined with motion sensors reduce water consumption in addition to using ultra high efficiency dual flush toilets that require 0.9 (3.5 liters) and 0.5 gallons (1.8 liters) per flush respectively. Most importantly Green New World’s water recycling system allows every drop of water to be used four to seven times dramatically reducing water consumption. 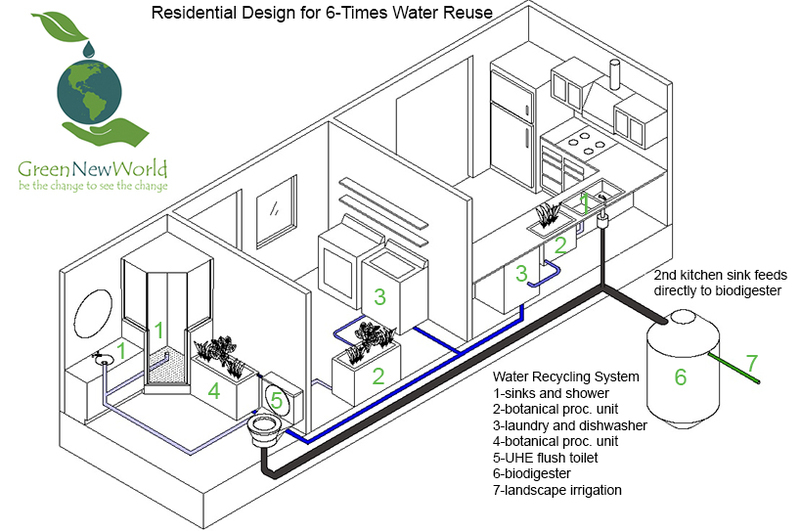 A household designed with a water recycling system first uses water for taps, showers and baths. Then it is filtered by especially designed botanical greywater units with greywater tolerant plants and disinfected with ozone for further use. At the next stage the water is reused for dish washers and laundry machines and filtered again by another botanical greywater unit. Thereafter the water is used for the ultra high efficiency flush toilet that feeds into an anaerobic digestion reactor or a conventional onsite septic system from which the overflow feeds into a leachfield that provides safe irrigation to orchards and the landscape. With a fivefold interior reuse of every drop of water and water saving appliances and fixtures the average residential consumption of water per person can easily be reduced to less than 20 gallons (76 liters) per day. This system lends itself to newly designed homes and is difficult to integrate in an already built residential home. However for those wishing to retrofit there existing homes a simpler alternative to the above described reuse of water can be installed in most bathrooms where water from taps, shower and bath are filtered through a botanical greywater unit and then reused to flush a toilet. This simple remodeling alone can save around 20 gallons (78 liters) of water per person per day.